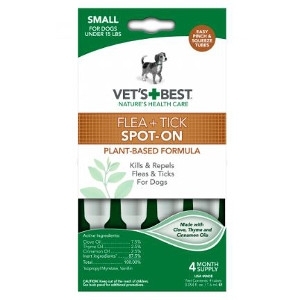 Each dose kills and repels fleas and ticks for up to one month. Easy to Open, Pinch-and-Squeeze tubes can easily be applied between dog's shoulder blades. Made with a unique blend of certified natural oils like Clove, Thyme and Cinnamon oils. Independently tested and proven effective. One package contains 4 months supply. Made in the USA.